Sword of Fargoal 2, an upcoming game for Mac OS X, iOS, PC, and Linux, just launched a fund raising project on Kickstarter. This will be a sequel to the iOS and Mac OS X game that was itself a re-imagining of the original Commodore 64 game from 1980. The team is high-end, as it includes original developer Kevin McCord, developer Paul Pridham (Saucelifter, Punch Quest), Emmy award-winning animator Charlie Canfield, and British composer Daniel “LittleBigPlanet” Pemberton–all of whom contributed to the highly-reviewed iOS/Mac port from a couple years ago, published by Chillingo/EA. The Kickstarter campaign was launched to help take the sequel, Sword of Fargoal 2, from 80 percent done to fully done. The extra funding will help the team add new music, animations, and graphics to the game, as well as polish up the game engine itself to ensure fluid movement and controls. The first Sword of Fargoal was developed in 1979 by Jeff McCord, who has retained the licence for the game and made a fantastic iOS port of it a few years back. The original game was a dungeon crawler with a brutal difficulty level that used randomly generated dungeons, a type of game called a “rogue-like” after the original game that created the genre itself, Rogue, which came out in 1980. Maybe we should be calling the genre Fargoal-like, then. Regardless, the iOS/Mac OS version of Sword of Fargoal was called one of the top 150 video games of all time by Computer Gaming World, won the Best Retro Game (iPad division) award in the 2010 Best App Ever Awards, and has even “been recognized by the Guinness World Records 2012, Gamer’s Edition as ‘Most critically acclaimed ‘Roguelike’ for iOS,'” perhaps the most specific award ever given. The game is scheduled for a May 2013 release, and will include many new features, including, perhaps, a new five-person multiplayer mode. Ooh, exciting! Mac/PC/Linux plus iOS versions: Sword of Fargoal 2 in all its glory on multiple platforms. Everything rebuilt from the ground up! 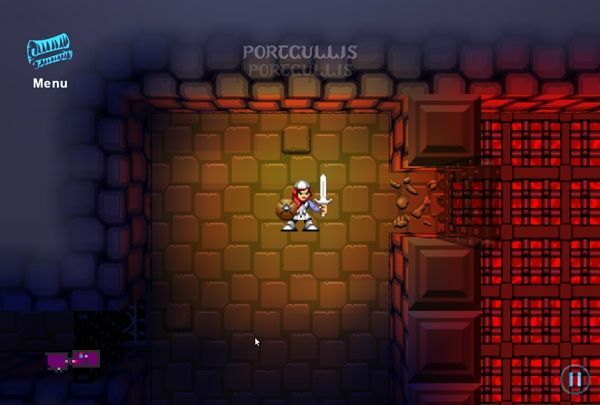 Over 100 procedural dungeon levels: Different challenges and rewards every time you play. New character types: Fighter, Ranger, Thief, Magic User, plus male and female versions of both. New combat and ranged weapons, armor, magic, and effects. More goodies: Potions, wands, rods, spells, rings, amulets, traps, treasures, and poisons. Everything new about monsters throughout the dungeon: All new intelligent monster behavior, new monster types, and graphics. New quests and side-explorations: You can explore in brand new ways throughout all-new dungeon levels and types. New interactive dungeon environments: You’ll be able to pick locks, break containers, unlock items, burn items, create chain reaction explosions, ‘tinker’ to make your own traps, and change your environment in other cool ways. New unlockable “Ruins of Fargoal” mode: If you manage to free the Sword and win the game, you will be able to return to the dungeon and see how it has changed. Hint: it will be even more dangerous and unstable, with new riches to be found. New “Action Cards”: Cut scene cards to show you when you’ve achieved different elements of the game. You will have the ability to save, export, and re-watch you adventure like a slide show with music. Plushies (Stretch Goal): What will they be? The Hero? The Sword? Ogre? Werebear? Dire Wolf? Wyvern? It’s up to you. Super Secret Fargoal “Project X” (Stretch Goal): We can’t tell you about this — yet, but if we hit this stretch goal, we’re building a [REDACTED]. All we can say is that the “X” stands for extra-awesome.